For a change I’d like to commence the game reports with commendations to today’s officials, three in the middle and one touchie, one having come all the way from N.Z. via the way of a naval visitation and seeking out a game to handle! Now that’s the spirit of rugby. It was a trio of entertaining games witnessed at Windsor on Saturday. In Women’s Premier action the two clubs committed to the spirit of player development, used the opportunity to expose younger and inexperienced players to the intensity of the game at a higher level. Westshore hung on for the 35 – 34 victory. CW welcomed rookie, Hailey McRae, a young fullback from Kelowna and Colleen Scott who played her first ever game of rugby. As the score suggests, it was a see-saw affair. Kudos to a smaller CW pack who hung with the opposition for most of the match. Tries for CW came from – a brace from Danica Pedrick and Brooke Bazian with singles to Hailey Mc Rae and Sara Einarson. The experience of Lizzie Adams and Julia Folk was a guiding light for the young players. Hats off to both teams. The Men’s Reserves started with solid pressure from the visitors. This territorial advantage lasted some fifteen minutes before they crossed the line, 5 – 0. CW did manage a foray into foreign territory but it was Caps again, 8 – 0 following a home team transgression. CW responded by finally moving the ball well, a move which ended with a spirited run from Keta, 8 – 7. CW appeared buoyed by this and continued with enthusiasm, only for poor handling to let them down and the loose ball went to Klaver who scooted 45m for a 13 – 7 lead on an enterprising individual effort. Thus endeth the first half. CW started with a flourish in the second stanza when Sandner made a 40m break, quick ball came to Kegode and he fed Logan on an unstoppable line and 14 – 13 lead, not to be bested. Next it was Anderson to Moar, back to Anderson from an alert tap penalty. A series of recycles ensued before Moar was over for a 19 – 13 score at the mid-point. The attack continued and another CW try ensued, 24 – 13. Caps frustration became evident and a penalty was added for a 27 – 13 spread. CW moved the ball well in this half with fewer errors and some forceful, determined lines from the runners. The Caps bigger forwards appeared to tire and when a lineout was won by CW about eight meters out, Elliott dived over in the late going for a well-earned 32 – 13 win. For Caps, I liked Baker, Orr and Scott in the pack. Waddell at #9 was a feisty customer, initiating plenty of action and Cameron in the centers was a handful. For the Tricolors there were many to like. Sandner received plenty of attention yet he came through as a constant threat. Moreau, Anderson and Sergio were good in the pack however it was Moar who earned the boys’ Hard Hat and Caps M-o-M, standing a cut above. In the backs, Logan, Kegode were both money but Davey Keta was a gem. Well done, Divvies. In the main game, CW started well – early pressure saw a probe from Isaac Kay and Pat Kay almost orchestrated Morra and it was Morra who minutes later, swiveled from a tackle and fed Adibe from his far wing, pursuing work and the first blood. 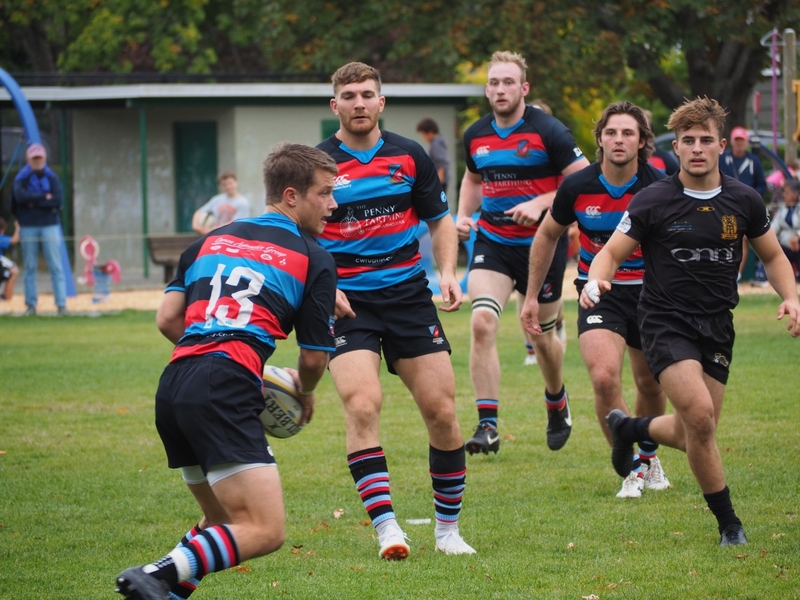 The first scrum came at seven minutes and Caps shunted CW severely backwards – no doubt an unexpected shock to a proud FRF. It was heavily attributed to loose head, Mills. From this ‘wake up’, Caps furthered their cause with a nifty chip from Robinson to Sam Franklin at ten minutes for a 5 – 5 score and fulfillment of a pre-game touting as danger men. Caps came back with a good line from Johnny Franklin which earned the black and gold a penalty. From the subsequent lineout, CW was again under the cosh. Caps earned another positive scrum, resulting in Mills driving for a well-earned ten meter try. The next series of plays was interesting in that CW attack was repelled and Caps pinched a lineout to create visitor’s pressure and adding that to the measure of control in the sets, matters for the faithful appeared dubious. Thus it was ironical that this ascendancy faltered when the sure handed Franklin coughed one up and an ever alert Schellie dribbled, with Pat Kay following up on the round ball skills and diving over for the touch and a 12 – 10 lead at twenty-five minutes. CW added a penalty but Caps were to be next in this see-saw battle when they earned a penalty from long range, found touch deep and scored from a driving lineout to lead 17 – 15, which they carried to the interval. Another of the same was added to their lead a mere two minutes into the second half and a 22 – 15 score was on the board. CW countered from a prolonged “advantage” call following the kick-off. The ball went through numerous hands and Bradley crossed to reduce the deficit. Soon after an old fashioned punting dual ensued and Pat Kay backed himself for what could have arguably been the TSN Turning Point. Kay blistered, avoiding outstretched tacklers and sending Morra to the try line from 35 meters out. Honorable mention is credited Schellie for his three–in-a-row attacking tackles as the precursor to this broken play. ‘onya, Fireball! One sensed the Caps plot was being tested as the home team slowly progressed downfield. A sloppy Capilano pass ended up with Pat Kay ‘flicking’ the ball to Schellie and it looked like Braddock was over, only to have been deemed to knock on. From a solid CW scrum the probing went open side, Woolridge drove to the line and popped to Pitblado for a 32 – 22 score. Caps asked questions but were rebuffed. Not to be turned away, they did retain possession and threw phase upon phase at the line. Eventually lock, Merinsky (deservedly), crossed to make matters tense. There was a spirited period following a healthy Pat Kay attacking tackle and a resultant penalty to CW. Despite this, Caps somehow regained possession with intent of scoring but again it was a solid tackle from Isaac Kay that enabled Morra to dive on a loose ball, get to his feet and go 40m for his brace – a great individual hustle and the exclamation point, 39 – 27, some nice flair for the National 7’s coach present, to have witnessed! Thanks to all the players for your efforts in an entertaining contest. For the Caps, hats off to all of the forwards, Mills, de Freitas, Merinsky and Boyd being just a little more visible than their mates. In the backs, Cattanack was solid and Robinson had some moments but it was the forwards who crushed it. This writer will predict that this Caps side will win considerably more games than they lose this season. For CW, apart from the set pieces, certainly in the first half which must have been a shock, there was plenty to like. A late withdrawal by Polson, unavailability of Stewart and an injury to Finnemore, saw Kelton Dawe play a blinder. Sudsy (M-o-M) and Bradley, the other loosies were also effective and got through plenty of work. All the backs played well and it was impossible to say one was better than the other, although Schellie earned the players’ Hard Hat and Caps vote for M-o-M. I must also recognize Adibe, given the honor this week of captaining the side from his wing position, not an easy task. He led by example and displayed poise. Pitblado served Kay to enable his best. Isaac Kay and Schellie were true blue and Morra’s brace proved to game-breakers. Dalsin at the back was also solid. The Prems now take a break, fast out of the gate and undefeated at three. Next up are the defending Champs, the Ravens with their farm team Rippers, also being a tough customer. This match will be at Windsor. Hopefully it will attract more of the Faithful to be in attendance for yet another intriguing encounter.